Transforming your garage door into a wind-rated door doesn’t mean sacrificing the curb appeal and beauty you have come to expect from Overhead Door. Our industry-leading wind-rated garage doors are the pinnacle of high-wind protection and stylish designs. As the largest point of entry, your garage door offers the largest opportunity for high-pressure havoc. When high winds hit, a reinforced garage door is one of your home’s most-important safeguards against nature’s fury. 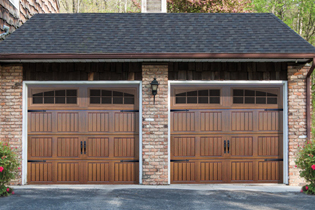 Because garage doors are so large, pressure from hurricane activity or high winds can cause garage doors to detach from their tracks or even collapse. If your door fails, then damaging, life-threatening winds can enter, blowing out doors, windows, walls and the roof. Couple this with exterior debris, such as signs, roofing materials and siding, and lives could be jeopardized. That’s why Overhead Door created an exclusive line of innovative wind-load garage doors, fashioned to withstand nature’s power and keep your family, employees and possessions safe. Our wind-load options for residential, commercial and industrial applications provide superior craftsmanship, durability and trouble-free performance and additional protection against hurricanes, hind-wind damages, internal and external pressure changes and wind-borne debris. The following garage door collections meet the International Building Code (IBC), International Residential Code (IRC) and Texas Department of Insurance Code Requirements. The following garage door collections meet the International Building Code (IBC), and International Residential Code (IRC). 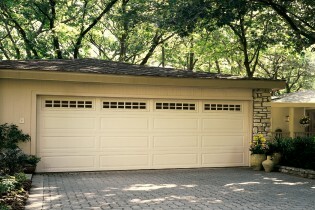 for more details about wind load garage doors. Hurricane Areas Across the U.S.A. The information on this page is to be used for reference only. Consult your building department or a registered engineer or architect for site specific applications. Values are nominal design 3-second gust wind speeds in miles per hour (m/s) at 33 ft. (10m) above ground for Exposure C category. Linear interpolation between contours is permitted. Islands and coastal areas outside the last contour shall use the last wind speed contour of the coastal area. ​​​When you choose select garage doors from Overhead Door, enjoy the flexibility of upgrading your product to be wind-load compliant with your local codes. 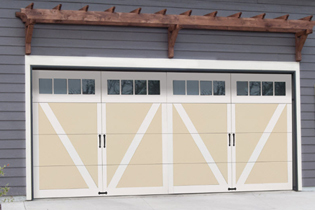 Your local Overhead Door Distributor can suggest a wind-resistant garage door that offers the highest level of protection for your situation or geographic region. Windows made of clear, impact-resistant glass are compatible with a variety of decorative trim styles to complement all home designs. All wind-rated windows are engineered to meet local codes. How can I determine the wind speed requirements for my location? The American Society of Civil Engineers (ASCE) has developed standards covering wind loads on buildings and other structures. This is the base standard for most wind provisions used in U.S. building codes. The basic wind speed maps from ASCE 7-05 or ASCE 7-10 can help an individual to determine the proper wind speed delineation zones for their area. In addition, some states such as Florida provide a listing of wind speed maps by county. For the specific requirements for your area, contact your local building official. 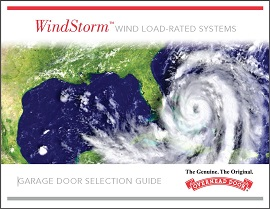 How do I know if my door is compliant with the wind requirements of the Florida Building Code? The Florida Building Code has specific design pressure requirement for garage doors (table 1606.2E). Overhead Door goes through the Florida Building Commission Product Approval system for many of its doors. Additional information about the Florida code can be found through the Florida Building Commission. What is the difference between design pressures and test pressures? Design pressures are the pressures required by code that a door is designed to withstand and are calculated using variables taking into account wind speed, structure configuration, and site location. Test pressures are the pressures that a door has been tested to in controlled laboratory conditions. Test pressures for garage doors have a 50% safety factor making test pressures one and a half times higher than design pressures. What is the difference between wind speed and wind pressure? Wind speed is a velocity measured in miles per hour (mph). Wind pressure is a force measured in pounds per square foot (psf). Wind speed alone cannot be used to determine the wind pressures on a structure. Wind speed is one of many variables used in calculating design wind pressures that take into account the structure configuration and site location. Can I add reinforcement to my door to make it a wind load door? A wind loaded garage door is designed with specific components, such as track, jamb brackets, hinges, rollers and reinforcing struts that meet designated design wind pressures. All of these components, along with the door sections comprise a complete wind resistive system. You cannot add components to a door that are not part of the original door installation. By adding reinforcement to the door this does not mean it will increase the wind resistance of the door. It is also extremely dangerous because the components add weight, which can overload the counterbalance system resulting failure and possible injury. What does “Exposure Category” mean? An exposure category (B, C, or D) is a condition that adequately reflects the characteristics of ground surface irregularities for the site where a structure is located. Exposure category is used in calculating the required design wind pressures for a structure with exposure B yielding the lowest wind pressures and exposure D yielding the highest wind pressures. Exposure B applies to urban and suburban areas, wooded areas or other terrain with numerous closely spaced obstructions having the size of single-family dwellings or larger. Exposure B is typically associated with site locations in a residential subdivision. Most site locations are assumed to be Exposure B unless the site meets the definition of another type of exposure. Exposure C applies to open terrain with scattered obstructions having heights generally less than 30 feet extending more than 1,500 feet from the building site. 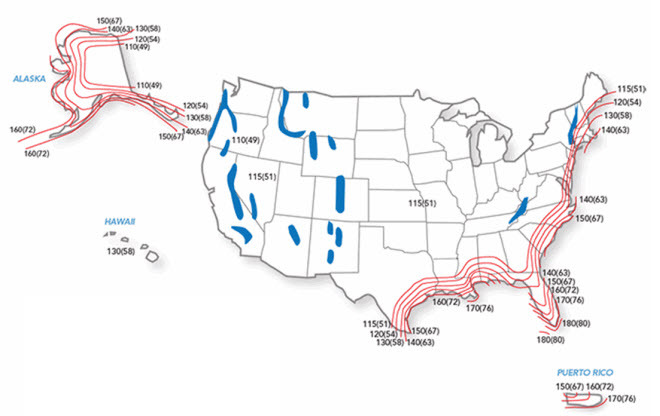 Exposure C includes flat open country, grasslands, and shorelines in hurricane-prone regions. Exposure D applies to flat, unobstructed areas exposed to wind flowing over open water (excluding shorelines in hurricane-prone regions) for a distance of at least 1 mile. Exposure D includes shorelines in inland waterways, the Great Lakes, and coastal areas of California, Oregon, Washington, and Alaska. Exposure D extends inland from the shoreline a distance of 1,500 feet or 10 times the height of the building or structure, whichever is greater. When you select a standard garage door from the following collections, you can upgrade with the beauty, quality and durability of an innovative wind-resistant door from Overhead Door.